Zhang, Yizhe and Yang, Lin and Chen, Jianxu and Fredericksen, Maridel and Hughes, David P. and Chen, Danny Z. This work improves the performance of a segmentation network by utilizing unlabelled data. They use a discriminator (they call EN) to distinguish between annotated and unannotated examples. 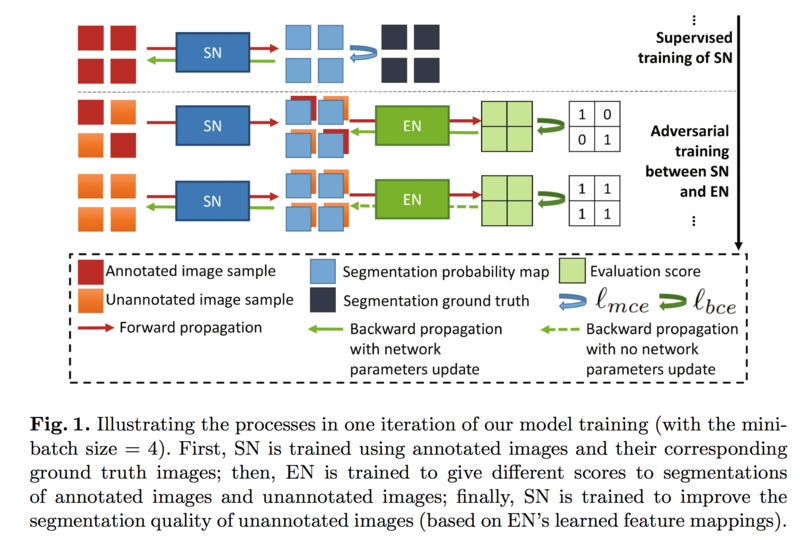 They then train the segmentation generator (they call SN) based on what will fool the discriminator. This work is really great. They are using the segmentation to condition the discriminator which will learn to point out flaws when applying the segmentation to the unlabelled examples. Then these flaws in the segmentation are corrected by using the gradients from the discriminator to adjust the segmentation. In contrast with other semi-supervised approaches which learn a latent space for all samples, labelled and unlabelled, and then uses this space to learn a classifier or segmentation; this approach looks for the boundaries of the space only. The unlabelled examples are used to bias the representation learned by the segmentation network to conform to the distribution represented by all observed examples.